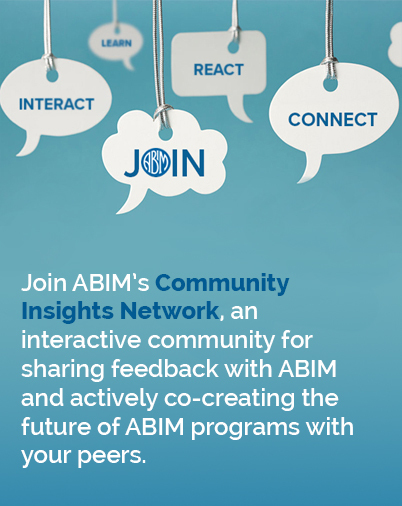 At ABIM, we have the privilege of working with the community to certify that physicians are uniquely qualified for the work they do. But we aren’t just certifying that doctors have the knowledge necessary to practice medicine. We are recognizing doctors for their pursuit of knowledge throughout their careers and their commitment to using that knowledge in service of their patients. We have more information, more technology and more cures than ever before. Doctors are wielding the kind of dynamic knowledge that is saving lives in a way never thought possible. But today’s tough pill to swallow is that all of this change also brings an unprecedented amount of pressure for doctors to be better, faster and more frugal in a world that is increasingly skeptical of expertise. It’s difficult to pinpoint exactly what must be done to overcome such deep skepticism, but we do know that relationships are at the core of influence. In a physician’s line of work, the doctor-patient relationship is based on more than just knowledge. It’s based on trust. Every day at ABIM, we work with physicians to set standards for medical knowledge and practice. And every day, we see physicians continue to step up and meet (and in many cases exceed) those standards. This isn’t because board certification by itself assures a doctor-patient relationship built on trust, but it is a key part of a whole network of actions that physicians take demonstrating a commitment to their peers and patients to build that trust. While the recognition of expertise is more necessary than ever, it’s the recognition of the pursuit that we’d like to celebrate today. That is what being a physician is all about— the pursuit of knowledge, the pursuit of guidance, and the pursuit of understanding— all in service to others. This willingness to invest not just in professional development but also in seeking to understand their patients—whether through study or at the bedside—is what sets physicians apart. On this Doctor’s Day, we recognize physicians for the work that they do every day to distinguish themselves in order to build trust with their peers and patients, and we recommit our organization to being an ally in this noble pursuit.